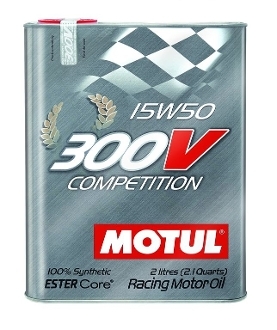 100% synthetic racing motor oil based on ESTER Core® technology. Through technical partnerships with most prestigious Teams of car racing, MOTUL has developed a wide range of lubricants for Racing and Sport cars. The 300V motorsport line improves performance of the latest generation engines along with high protection against wear, oil pressure drop and oxidation due to high temperature. Power & engine protection. Medium to high engine dilution.